Religion in Tajikistan, corruption scandals in Uzbekistan, and other weekend reads. While Kyrgyzstan features the region’s most open civil society — with numerous active human rights and other nongovernmental groups — many analysts have observed a backslide in the past year. Eurasianet points to statements made by President Almazbek Atambayev regarding NGOs as fanning the flames of suspicion. Human rights advocates are not the only targets; earlier this year Umar Farooq, a freelance journalist, was briefly detained by the authorities while reporting on the conviction (on charges of inciting religious hatred) of Rashat Kamalov, a popular imam. Other Kyrgyzstan stories: Bruce Pannier waxes poetic about Karakol and Kyrgyz environmental activists call for action on climate change. In Limiting Islam, Tajikistan Risks Radicalization: In a report for RFE/RL, Farangis Najibullah and Charles Recknagel parse through Tajikistan’s notably tense relationship with Islam, a religion most of its people adhere to in one fashion or another. “Tajik authorities have done their best to eliminate outward displays of what they see as dangerous, imported aspects of Islam in recent years,” they write. The authorities may have succeeded on a superficial level — fewer beards and headscarves in public — but they risk “deepening divides between secular Dushanbe and conservative Muslims.” The crackdown on Islam is a double-edged sword. On the one hand, some may be intimidated into adhering to strict government rules while others may react by turning to more extreme methods of pushing back against the state. Faridun Hodizoda, a Dushanbe-based expert on religious issues, says that “some radical” members of the party had previously criticized the leadership for being too moderate. 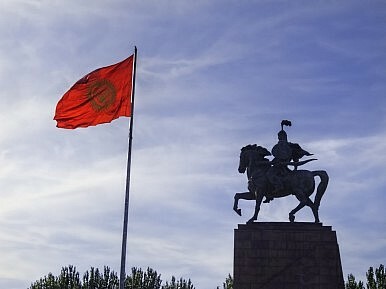 Other Tajikistan stories: Tajikistan jails a group of men for hoisting a flag “similar” to the ISIS flag — jail terms range from seven to 27 years for what might have just been a prank. Russian authorities are allowing the father of a baby that died in the custody of the migration service to be listed as a complainant — rather than a witness — in the investigation. Other Uzbekistan stories: Bloomberg has a rundown of Uzbekistan’s corruption scandals — looking at power, pop and a bunch of billionaires. Richard Orange, for Eurasianet, provides an update on the ongoing trial of an Uzbek man accused of attempting to assassinate an Uzbek cleric living in exile in Sweden. Meanwhile, "cautious optimism" about Uzbekistan and a quick lesson on Soviet history in the region; weekend reading.